The rising oil price has the potential to derail the recovery, but this is an unlikely outcome as supplies are not stretched. For most of the last quarter it has been quite clear that there is a strong 2011 bull case and a strong 2011 bear case for equities – and there has been no shortage of boosters for either of these views. But performance is what counts, and performance has been on the side of the bulls. We have seen shock after shock thrown at equity markets: fire in the Middle East, a devastating earthquake in Japan, and a continuing sovereign debt crisis in Europe – but markets have shown nothing but resilience. Equities seem to require only the thinnest of excuses to move upwards. Liquidity and a lack of investment alternatives have proved powerful friends. Is that about to change? We certainly need to take the bear case seriously. First, the bear points to the rollover in the policy cycle. The days of free money and fiscal ease in the developed world are numbered. In Europe monetary policy is tightening, and the state is taking more tax while creating less demand. In the US quantitative easing is set to end, and the political cycle is bringing fiscal tightening closer. Meanwhile in emerging markets policy continues to tighten, with China leading the charge, and the rest beginning or preparing to follow. So on the policy front this is hardly a bullish moment. Next, says the bear, look at the likely weakening of industrial production data and the high level of inventories. Add to that the emerging market impact of a very sharp contraction in activity in Japan, and the developed market impact of the long-delayed realization that at least one EU state is going to default on its sovereign debt. Finally, factor in the continued weakness of the developed market consumer as confidence remains flat or even falls, and the high price of oil. There is a basis of truth in all of these arguments, but we need to distinguish between the slow evolution of the cycles in policy and business activity – changes that markets are expert in discounting well in advance – and extraneous factors with the capacity to do systemic harm. The biggest systemic risk is the oil price. 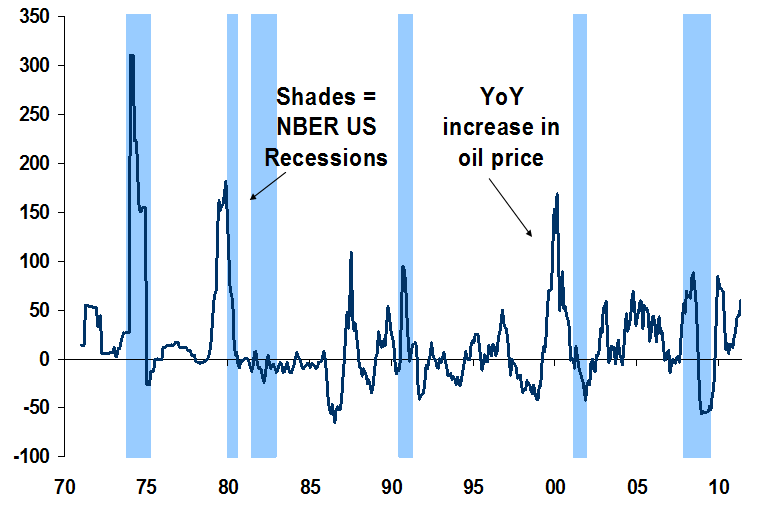 Sharply rising oil prices are fairly closely correlated with recessions, and over the last few decades every time the oil price has doubled within a year, recession has followed. We are some way off a one-year doubling in oil prices – a year ago Brent Crude was around $85 a barrel which was also roughly the average for 2010 as a whole, while today oil stands at around $125 a barrel. But the price is rising steadily, and has been since September last year. If oil prices continue their current track they will be at $180 by September 2011, and that would represent a doubling in a little less than 12 months. Will that happen? It depends why oil is rising. We are fairly sure that today oil is rising on concerns about supply, which means lost production in the Middle East. It can hardly be rising due to demand, as recent demand has been lower than expected as a result of the Japanese earthquake. Longer-term demand has also been low – total world consumption actually fell by over one million barrels a day in 2010 (the fall in OECD consumption far outweighed the rise in emerging markets). Given this weak demand, how realistic are the fears that are driving the oil price upwards? The answer is, not very realistic. The only significant lost production in the Middle East today is from Libya. Libya normally contributes around 2% of world production of crude, or just over 1.6 million barrels a day.As is well known, Saudi Arabia –the largest producer of oil after the Russian Federation – has a total production capacity that is around 3 million barrels per day in excess of current production. In short, Saudi Arabia is capable of increasing production to cover what has been lost from Libya, twice over. Other non-OPEC producers have also been raising capacity, and overall the output gap has been increasing. Of course, production could be lost elsewhere. If the Iranian oil business (over 5% of the world total) were to be disrupted, the picture would change, dramatically. However, we don’t see that happening. In short, oil prices are rising on the back of fears that are unlikely to be realised – plus some effect from the liquidity that central banks have rightly seen necessary to pump into financial markets. From where we are sitting, that undermines the bear case. We just don’t think that the oil price is going to derail recovery. On the other hand, the next six months are likely to be slower than the previous six months. Looking beyond oil, the key data will come from China: the makings of a soft landing are there, but a lot depends on where inflation peaks in the summer. It’s not a certain outlook, it never is. But on balance, in equity markets we think hope will outpace fear.